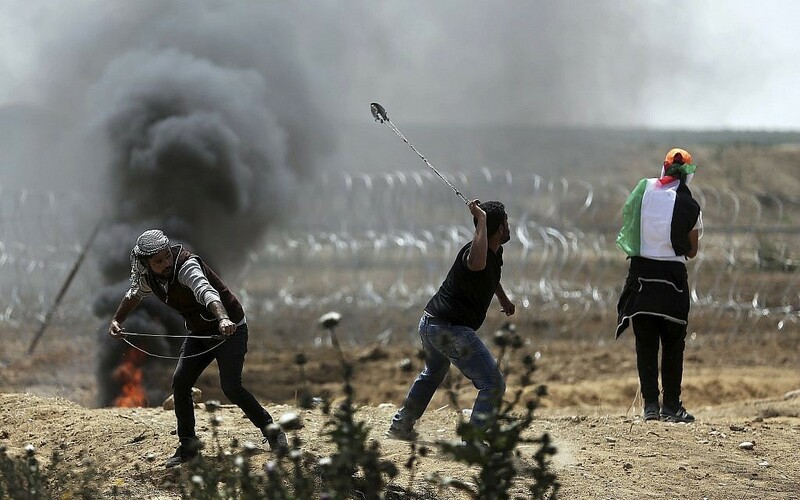 The Israeli military said it opened fire at a Palestinian who tried to damage the fence on the Israel-Gaza border, the man identified by Israeli Defence Force (IDF) as Ataf Mohammed Salah, 32. This man repeatedly tried to sabotage the Gaza Strip border fence, the army said. He was given medical treatment but “later on, the suspect succumbed to his wounds,” it added. In the same week, just 24 hours before this happened three more Palestinians detained by IDF following their efforts to breach Gaza border fence; caught with 2 knives and taken for questioning. The Gaza border has been tense for months. Hamas has led weekly border protests since March 30 aimed in part at drawing attention to the Israeli-Egyptian blockade imposed after it took control of the territory in 2007. Since then, at least 128 protesters have been killed by Israeli fire and one Israeli soldier was killed by a Gaza sniper. The most challenging problem faced by world for over 45 years now has been the negotiations on peace process between Israel and Palestine. While several US president shave tried to broker deals, the results have never been fruitful. As recently as last month the team working on President Donald Trump’s Middle East peace plan has said neither Israelis nor Palestinians would be happy with the proposal. While diplomatic solutions take their own time, it is time to use technology to save lives. Given the serious risks of escalating violence, the desperate humanitarian situation in Gaza, and the continued costs of the status quo, it is vital that the Middle East Peace Process leads to some daylight for both Palestinians as well as Israelis. A central capability that all law enforcement and national security authorities share is the ability to definitively identify and thwart criminal suspects in a timely manner. An agency’s failure to possess this simple, yet vital, capacity can result in consequences that undermine the rule of law, including missed opportunities to implicate suspects or the unwitting release of perpetrators. Brainwave Science is a company established with a mission and vision to supply technologies that can bring more peace to humanity at a global level. One such technology produced and provided by Brainwave Science is iCognative – a ground-breaking technological innovation that uses memory related recognition brain patterns to equip law enforcement agents with a powerful intelligence collection solution. This advanced investigative facility offers rapid and accurate identification of criminal suspects using specific brainwave response. iCognative utilizes advancements made in the field of neuroscience to enable a highly accurate identification of a person by distinguishing what a suspect, witness, or victim truly knows. Furthermore, the technology behind it is easy to use by law enforcement and provides valuable intelligence. In cases of national security threats, the iCognative technology enables agencies and officers acquire valuable relevant information out of suspects’ brain. The resulting impact of a solution that aids investigation and intelligence collection disciplines are an expedited and improved judicial process leads to an increase in the number of solved cases. This technological innovation empowers national security agencies and other law enforcement personnel in interrogation and investigation by corroborating suspects’ testimonies and cross-verifying information on suspects. iCognative is the crucial missing link between forensic and biometric technologies. No other technology currently exists that determines through reliable, objective, and scientific means whether a person has specific knowledge stored in the brain with over 99% accuracy. Border security is crucial for Israel and violations at border cause violence. Utilization of specific screening at the border the system matches information stored in the memory bank of the suspect with information from the crime scene, valuably aiding law enforcement officials with the ability to distinguish between an innocent suspect and perpetrator. Three suspects currently apprehended at Gaza border by IDF can be subjected to iCognative test. IDF can deploy this technology using stimuli collected during the current and other investigations related to breaches at the border fence in northern Gaza. Details including identities of other Palestinian; plans for future attacks, dates and times of attacks; methods used to breach security; bomb-making knowledge all such information along with corroborated testimonies of others can be used as a stimulus to conduct iCognative test to elicit more information concealed in the brains of the suspects. It is equally capable of matching information related to the planning stages of a criminal activities directly from a suspect’s memory. iCognative is a powerful specific screening tool that identifies perpetrators before the act is carried out. In the current volatile political relations amongst some of the biggest nations in the world, intelligent iCognative technology can prove to be a real sustainable help that will gain authorities important information, relevant to help them keep their nations safe from any threat.